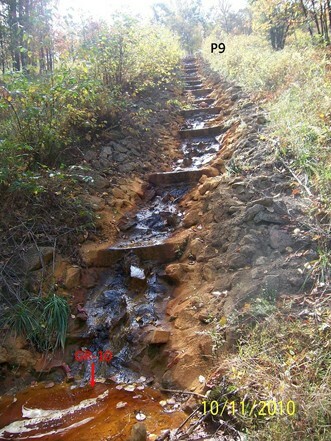 When appropriately designed and maintained, passive systems can provide long-term, efficient, and effective treatment for many acid mine drainage (AMD) sources. Passive AMD treatment relies on natural processes to neutralize acidity and to oxidize or reduce and precipitate metal contaminants. Passive treatment is most suitable for small to moderate AMD discharges of appropriate chemistry, but periodic inspection and maintenance plus eventual renovation are generally required. Passive treatment technologies can be separated into biological and geochemical types. Biological passive treatment technologies generally rely on bacterial activity, and may use organic matter to stimulate microbial sulfate reduction and to adsorb contaminants; constructed wetlands, vertical flow wetlands, and bioreactors are all examples. Geochemical systems place alkalinity-generating materials such as limestone in contact with AMD (direct treatment) or with fresh water up-gradient of the AMD. Most passive treatment systems employ multiple methods, often in series, to promote acid neutralization and oxidation and precipitation of the resulting metal flocs. Before selecting an appropriate treatment technology, the AMD conditions and chemistry must be characterized. Flow, acidity and alkalinity, metal, and dissolved oxygen concentrations are critical parameters. This paper reviews the current state of passive system technology development, provides results for various system types, and provides guidance for sizing and effective operation. The online version of this article (doi: 10.1007/s10230-016-0417-1) contains supplementary material, which is available to authorized users. Passive Systeme können über einen langen Zeitraum unterschiedlichste saure Grubenwässer (AMD) effizient und wirksam reinigen, sofern sie sachgerecht geplant und errichtet werden. Die passive Reinigung saurer Grubenwässer beruht auf natürlichen Prozessen der Säureneutralisation, Oxidation oder Reduktion und Ausfällung von metallischen Schadstoffen. Die Anwendung passiver Reinigungssysteme ist besonders geeignet für kleine bis mittlere AMD-Ströme mit entsprechendem Chemismus. Die periodische Überprüfung und Instandhaltung und gegebenfalls Erneuerung sind aber generell notwendig. Die passiven Reinigungstechnologien können in biologische und geochemische Typen eingeteilt werden. Die biologische Reinigung beruht generell auf bakterieller Tätigkeit und kann organisches Material nutzen um beispielsweise die mikrobielle Sulfatreduktion anzuregen und Verunreinigungen zu adsorbieren. Beispiele für biologische Systeme sind Pflanzenkläranlagen, vertikal durchströmte Pflanzenkläranlagen und Bioreaktoren. Geochemische Systeme bringen alkalisch wirkende Stoffe, wie z. B. Kalkstein, in Kontakt mit sauren Grubenwässern (direkte Reinigung) oder mit dem Frischwasseranstrom von sauren Grubenwässern. Die meisten passiven Reinigungssysteme verwenden multiple Methoden, um die Säureneutralisation, Oxidation und Ausfällung von Metallen zu fördern. Bevor ein geeignetes Reinigungssystem gewählt wird, müssen die AMD-Bedingungen sowie der Chemismus charakterisiert werden. Wesentliche Parameter sind der Durchfluss, die Acidität und Alkalinität sowie die Konzentration von Metallen und Sauerstoff. Der vorliegende Artikel bewertet den aktuellen Stand der Entwicklung passiver Systeme, stellt Ergebnisse verschiedener Systemtypen vor und bietet Hilfestellung bei der Dimensionierung und einem erfolgreichen Einsatz solcher Systeme. Los sistemas pasivos, apropiadamente diseñados y mantenidos, pueden proporcionar un efectivo y eficiente tratamiento, y por largo tiempo, de muchos drenajes ácidos de minas (AMD). Los tratamientos pasivos utilizan procesos naturales para neutralizar la acidez y oxidar o reducir y precipitar los metales contaminantes. Los tratamientos pasivos son más adecuados para pequeñas y moderadas descargas de AMD de química apropiada, pero se requieren generalmente periódicas inspecciones y periódico mantenimiento, más eventuales renovaciones. Las tecnologías pasivas de tratamiento pueden ser separadas entre biológicas y geoquímicas. Las biológicas utilizan la actividad bacteriana y pueden adicionar material orgánico para estimular la reducción microbiana de sulfato y para adsorber los contaminantes; ejemplos estas tecnologías son los humedales artificiales, los humedales de flujo vertical y los biorreactores. Los sistemas geoquímicos utilizan materiales generadores de alcalinidad como la caliza en contacto con AMD (tratamiento directo) o con agua fresca gradiente arriba del AMD. La mayoría de los sistemas de tratamiento pasivo emplean múltiples métodos, frecuentemente en serie, para lograr la neutralización de ácidos y la precipitación de los metales. Antes de seleccionar la tecnología de tratamiento apropiada, se deben caracterizar las condiciones del AMD. Los parámetros críticos son flujo, acidez y alcalinidad y concentraciones de oxígeno disuelto y metales. Este trabajo revisa el actual desarrollo de la tecnología de sistemas pasivos, muestra resultados obtenidos en varios tipos de sistemas y proporciona una guía orientativa sobre el tamaño necesario para una operación efectiva. Oxidation of pyritic materials during and after mining produces sulfuric acid and metal ions. These products react with host rock and surface and groundwater to create a range of water chemistries from pH 2 to 8 and elevated ion concentrations. Such waters have traditionally been called acid mine drainage (AMD) and alkaline mine drainage. In this paper, we use AMD when the water is acidic and state clearly in the text when the water being referred to is not acidic. When AMD enters surface water bodies, biotic impairment often occurs through direct toxicity, habitat alteration by metal precipitates, nutrient cycle alterations, or other mechanisms, and the water often becomes unsuitable for domestic, agricultural, and industrial uses. The process of pyrite oxidation and its effects on water resources have been known for centuries (Nordstrom 2011; Seal and Shanks 2008) and AMD is a worldwide concern (Younger and Wolkersdorfer 2004). Damaging effects of AMD have been described by researchers in Asia (David 2003; Wei et al. 2013; Yang et al. 2007), New Zealand (Trumm and Ball 2014; Winterbourn et al. 2000), Europe (Casiot et al. 2009; Gray and Delaney 2008), South America (Strosnider et al. 2011a, b), and the USA (Cherry et al. 2001; Kleinmann 1989; Soucek et al. 2000). In the eastern USA alone, >10,000 km of streams and >72,000 ha of lakes and reservoirs were adversely affected by AMD prior to 1990 (Herlihy et al. 1990; Kleinmann 1989). The acidity level, metal composition and concentrations of a given AMD source are controlled by the type and amount of sulfides and associated neutralizing minerals, such as calcite and dolomite. Sulfide and carbonate mineral concentrations are effective predictors of acid-producing potential of mine spoil (Sobek et al. 2000); where carbonates are absent, silica-containing minerals can provide notable amounts of alkalinity and should be accounted for (Ciccarelli et al. 2009; Miller et al. 2010). However, where there is sufficient carbonate and silicate minerals to neutralize the acidity, sulfate (SO4 2−) and various metal ions will still often persist in alkaline conditions. For example, even at elevated pH, reduced metal ions such as Fe2+ and Mn2+ are much more soluble than the more oxidized Fe3+ and Mn4+. Passive treatment of AMD was originally developed in the eastern USA’s Appalachian coalfield (Hedin et al. 1994; Kleinmann 1985; Kleinmann et al. 1983; Wieder and Lang 1982), where many coal seams, especially in northern Appalachia, are associated with pyritic geologic strata. Since 1972, U.S. Federal law has required active mines to treat AMD prior to discharge. However, pre-law mining left a legacy of mine discharges that continue to impair the water quality of aquatic resources because no responsible party exists for treatment. Hence, the region’s coal operators, regulatory agencies, citizens, and researchers sought low cost methods for mitigating these legacy AMD sources in order to restore impaired watersheds. Many types of passive AMD treatment technologies were developed to fit a wide variety of water conditions and many are now also being used at active mine sites. Passive treatment is commonly considered in settings where neither the severity of AMD nor the available resources warrant active treatment that require continuous additions of alkaline chemical reagents (“active treatment”) such as lime (CaO), slaked or hydrated lime (Ca(OH)2), anhydrous ammonia (NH3), or sodium hydroxide (NaOH) to neutralize acidity (Johnson and Hallberg 2005; Skousen et al. 1998). Active treatment requires ongoing expense for operation and maintenance, and commonly the provision of electric power. It also entails the risk of unintentional release of stored agents such as NH3 or NaOH that can result in harmful environmental or human exposure. Passive treatment is not subject to these problems. Passive treatment systems rely on naturally occurring biological, geochemical, and physical processes. Biological passive treatment relies nominally on bacterial activity, such as bacterially catalyzed Fe and Mn oxidation and generation of alkalinity and metal removal via microbial sulfate reduction, along with the removal of metals via adsorption and exchange reactions with organic matter. Geochemical passive treatment relies on the reaction of water with alkalinity-generating materials such as limestone and alkaline steel slag. The systems described here have world-wide application in treating polluted water from mining operations. An earlier review by Younger et al. (2002) described the chemistry and technology of passive and active treatment, as well as AMD generation. This overview emphasizes passive treatment options and design features that can enhance their effectiveness. Details regarding the mechanisms and rates of pyrite oxidation can be found in Evangelou (1995) and Blowes et al. (2003), and references therein. For AMD treatment to occur, pH has to be increased and dissolved metals have to be removed; i.e., solution acidity decreased and solution alkalinity increased. where the dissolved metal acidity (Fe or Al) has been converted completely to dissolved proton acidity and removed from the solution as a solid. Aqueous acidity can be measured directly using the standard hot peroxide method (APHA 1998; Kirby and Cravotta 2005b). Cravotta and Kirby (2004) urged commercial laboratories and researchers to use the Standard Methods (APHA 1998) procedure and report negative acidities. If pH and concentrations for dissolved metals are known, acidity can be estimated as the sum of proton acidity and the dissolved ions’ mineral acidities (Hedin et al. 1994; Kirby and Cravotta 2005a). Acidity is generally expressed as a CaCO3 equivalent mass converted to concentration or loading. Alkalinity is a measure of a water’s ability to neutralize acid additions (Kirby and Cravotta 2005a, b) and, like acidity, is expressed as its CaCO3 equivalent. Metals can be removed from AMD by precipitation and sorption. Fe and Al precipitate as hydroxides (Eq. 2), whereas manganese (Mn) is removed by a combination of oxidation and precipitation. Mn oxidation is slow in acidic solutions but can be accelerated by bacteria and catalysis by surfaces, including auto catalysis on MnO2 (Stumm and Morgan 1996a). FeS in this case is mackinawite, not pyrrhotite; alternatively, greigite (Fe3S4) may form. Both are generally precursors to pyrite. Thus, precipitating metals as a sulfide is typically repeating the cycle that placed the metals in the deposit originally, reversing the oxidation reaction that liberated them. The effect on solution-phase acidity when metals are removed by precipitation as metal hydroxides (Fe and Al) is straightforward and well understood (Stumm and Morgan 1996b). Metal removal by sulfide precipitation is much more complex than is suggested by Eqs. 4 and 6. Sulfate reduction reactions result in various sulfide products, but the alkalinity produced from these reduction reactions depends on the fate of the sulfide and the extent to which hydrogen sulfide or metal sulfides are produced. The reaction will reverse under oxidizing conditions, generating acidity and releasing metals all over again, so care must be taken to ensure that reducing conditions are maintained where metal sulfide precipitation has occurred. The contribution of microbial sulfate reduction to alkalinity has been criticized for failing to account for the complexity of labile carbon sources (Lindsay et al. 2011), the potential alkalinity contributions from Fe reduction (Vile and Weider 1993), and incomplete consideration of the fate of H2S (Vile and Weider 1993). The process is influenced by seasonal rate variations (i.e. reduced alkalinity generation rates in cold temperatures; Kuyucak et al. 2006), but these reduced rates can be lessened by selecting cold-hardy varieties of sulfate-reducing bacteria (Janin and Harrington 2015; Nordwick et al. 2006). Sorption, coprecipitation, and exchange to precipitated Fe and Mn, organic materials, and soil-like materials are additional mechanisms for metal removal. Sorption to organic materials is important for Al and divalent transition metals and Pb, while sorption to precipitated Fe and Mn and even limestone surfaces can contribute to trace metal removal (e.g. Zachara et al. 1991). Passive treatment processes for AMD rely on natural biological, geochemical, and physical processes to improve water quality. Primary passive technologies can be broadly divided into biological systems and geochemical systems that contain inorganic materials, such as carbonates. The biological systems include aerobic and anaerobic constructed wetlands (AeWs and AnWs), vertical flow wetlands (VFWs), bioreactors (SRB), and Mn removal beds (MRBs). The geochemical systems include anoxic limestone drains (ALDs), open limestone channels (OLCs), limestone leach beds (LLBs), steel slag leach beds (SLBs), diversion wells, limestone sand, and low pH Fe oxidation channels. Some of the systems that we have classified as biological also use geochemical processes. Selection of an appropriate passive system is based on water chemistry, flow rate, local topography, and site characteristics. Figure 1 (modified from Hedin et al. 1994) summarizes a strategy for selecting the appropriate type of passive system and Table 1 gives recommended sizing criteria. 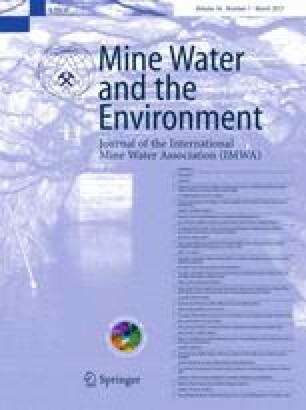 In general, AeWs are effective for removing metal precipitates from net-alkaline mine drainage. ALDs can treat acidic water with low concentrations of Al, Fe3+, and dissolved oxygen (DO), while VFWs, AnWs, flushable LLBs, and OLCs can treat net-acidic water with higher concentrations of Al, Fe3+, and DO. The science and technology supporting passive systems is increasing, which has improved our capacity to treat more difficult waters with appropriate designs and size. 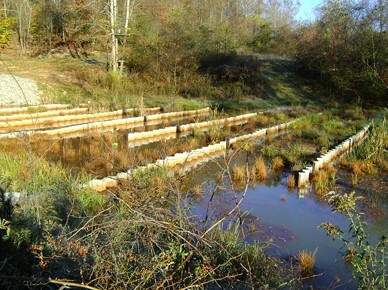 Constructed wetlands mimic their natural counterparts by creating an engineered ecosystem providing required redox, acid neutralization, and precipitate settling functions. They are often shallow excavations filled with flooded limestone gravel, soil, and organic matter to support wetland plants. Water treatment depends on dynamic biogeochemical reactions as the AMD travels through the wetland. Inorganic neutralization is a contributor if limestone is present in the substrate. Huntsman et al. (1978) and Wieder and Lang (1982) first noted amelioration of AMD following passage through naturally-occurring Sphagnum bogs in Ohio and West Virginia. Studies by Brooks et al. (1985), Samuel et al. (1988), and Sencindiver and Bhumbla (1988) documented similar phenomena in Typha wetlands. Although evidence suggests that some wetland plants show long-term adaptation to low pH and high metal concentrations, AMD eventually degrades the structure and function of natural wetlands. Instead, wetland systems should be designed and constructed to mimic the natural wetland functions that are responsible for AMD treatment with the intent of providing low cost, low maintenance AMD treatment (Kleinmann 1991). The three predominant styles are AeWs, AnWs, and VFWs. Thousands of wetlands have been constructed to receive AMD from active and abandoned mines. Passive metal retention mechanisms include: (1) metal oxidation facilitated by Fe and Mn oxidizing bacteria, hydroxide floc formation, precipitation, co-precipitation of trace metals with Fe hydroxide and Mn oxide, and capture; (2) reduction of metals and formation of metal sulfides in an organic matter layer; (3) complexation with organic matter; (4) sorption; and (5) direct uptake by living plants. Our approach herein is to define and describe each treatment type, outline the treatment mechanisms, review treatment efficiency from literature sources, and then add further commentary and summaries. AeWs are used to collect water and provide residence time for Fe oxidation, hydrolysis, and settling of the metal hydroxide flocs (Fig. 2). If the water is not net-alkaline, limestone has to be added to create net-alkaline conditions; otherwise, the long-term efficiency and effectiveness of the AeW will be poor. AeWs are sometimes simply a shallow basin, although vegetation such as Typha (cattails) is typically planted in a loose substrate to improve wildlife habitat and aesthetics, and to promote slow flow and attachment sites for floc. Wetland vegetation also encourages more uniform flow for more effective treatment. Mn oxidation occurs more slowly than Fe oxidation, and is sensitive to the presence of Fe2+, which will inhibit or reverse Mn oxidation (Luan et al. 2012; Wildeman et al. 1993). Consequently in aerobic, net-alkaline water, Fe and Mn hydroxides are removed sequentially with the practical result that Mn precipitation occurs (if at all) mainly in the later stages of the system after all of the Fe has been removed. AeWs are also commonly used as a final treatment stage like settling ponds and sometimes receive treated drainage from other treatment systems to capture the remaining fine suspended precipitates (Fig. 2). Aerobic wetlands are best suited for net-alkaline water where Fe and Mn are oxidized, precipitated and captured. The metal hydroxides are collected and retained in wetland substrates. Metal removal was successful in six AeWs where the influent water pH was >6 (Skousen and Ziemkiewicz 2005). Removal rates were 10–20 g m−2 day−1 for Fe and 0.5–1.0 g m−2 day−1 for Mn (Hedin et al. 1994). This estimate of removal efficiency remains a realistic field guideline for sizing AeWs, although it has been suggested that a better estimate of treatment effectiveness would rely on hydraulic retention time and influent acidity rather than surface area (Zipper and Skousen 2010). AeWs remove metals by slowing the water flow and allowing for oxidation (often bacterially catalyzed). As Fe2+ is oxidized, the resulting Fe3+ precipitates as ferric hydroxide in these structures as long as the pH is 3.5 or above. These structures also help to settle other metals that co-precipitate with the Fe. AnWs consist of Typha and other wetland vegetation planted in deep (>30 cm), permeable substrates comprised of soil mixed with peat moss, spent mushroom compost, sawdust, straw/manure, hay bales, or other organic materials (Fig. 3). These materials are often underlain or mixed with limestone to aid alkalinity generation. Alkalinity is generated by carbonate dissolution and microbial sulfate reduction. Limestone will continue to react in an anaerobic environment because there is no Fe3+; Fe2+ hydroxides will not form to coat the limestone surface. Reversion from reducing to oxidizing conditions will result in formation of insoluble Fe3+ hydroxide flocs, which will limit or prevent alkalinity generation and must be avoided. Several treatment mechanisms are enhanced in AnWs relative to AeWs, including formation and precipitation of metal sulfides, microbial generation of alkalinity by sulfate reduction reactions, metal exchange and complexation reactions, and continuous formation of carbonate alkalinity due to limestone dissolution under anoxic conditions. Therefore, AnWs are suitable for the treatment of net-acidic water. Like their aerobic counterparts, AnWs are most successful when used to treat small AMD flows of moderate acidity. Sizing criteria have been based on incoming Fe load (10 g m−2 day−1, Hedin and Nairn 1992) or acid load (3.5 g m−2 day−1, Hedin et al. 1994). Ziemkiewicz et al. (2003) showed that 17 AnWs removed acidity at an average rate of 16.6 g m−2 day−1. AnWs generally work well if not overwhelmed with acid or metal loads. As the substrate is consumed or filled with metal oxyhydroxides, AnWs decline in treatment efficiency, so a maintenance schedule is needed for systems treating high metal loads. Renovation can be accomplished by removing the floc and substrate and replacing it with fresh organic material and limestone. If the materials removed from the AnWs are a mixture of limestone, organic material, and Fe and Al hydroxides, they can be used as a soil material for disturbed area reclamation when spread on the surface and allowed to dry. However, if large volumes of the floc were anaerobic, they will contain sulfides. These sulfides can oxidize and release acidity, so care should be taken to dispose of these materials in an anaerobic environment. Floc materials from metal mine drainage treatment may contain high levels of metals and therefore may not be suitable for application to land. VFWs were developed in the late 1980s (Hendricks 1991) and described by Duddleston et al. (1992). Kepler and McCleary (1994) advanced the term successive alkalinity producing systems (SAPS), while other researchers have referred to them as reducing and alkalinity producing systems (RAPS, Watzlaf et al. 2000a), or vertical flow ponds. In a VFW, acidic water is ponded to a depth of 1–2 m over 0.2–0.6 m of an organic substrate, which rests on a 0.5–1 m layer of limestone (Fig. 4). The water’s hydraulic head drives it through the organic substrate, where O2 is consumed, producing anoxic conditions. The major function of the organic layer is reduction of all Fe to Fe2+, which prevents coating of the underlying limestone with ferric hydroxide. Acid neutralization occurs in the organic layer by sulfate reduction and in the limestone base. Vertical flow wetlands have perforated pipes embedded in a limestone layer at the bottom of the system and overlain by organic-matter substrate. Water is ponded on the surface which drives the water through the substrate, limestone and out through the pipes. A series of perforated drainage pipes below the limestone conveys the water into an aerobic wetland or settling pond where Fe and Mn are precipitated. Initially, these systems were sized to allow 16–24 h of retention time in the limestone layer, based on the sizing criteria for ALDs (Hedin et al. 1994), but later studies of performance suggested that an areal sizing parameter was appropriate (Rose 2006). As a result, many early VFWs were not adequately sized to treat their inflow. Reported VFW treatment efficiencies for acidity range from almost no treatment to 800 g m−2 day−1 (Jage et al. 2000, 2001; Ji et al. 2008; Kepler and McCleary 1994; LaBar et al. 2008; Rose 2003, 2004a, b, 2006; Rose and Dietz 2002; Rose et al. 2001; Skousen and Ziemkiewicz 2005; Watzlaf et al. 2000a). In general, performance is highest after start-up, especially if fine limestone is added to the compost layer. For VFW design purposes, a long-term acidity removal rate of 35 g m−2 day−1 has been proposed by Rose and coworkers after an extensive review of more than 30 VFWs in the Appalachian region (Rose 2003, 2004b; Rose et al. 2004, 2007). Watzlaf et al. (2000a) reported acidity removal rates for six VFWs ranging from 20 to 62 g m−2 day−1 and that limestone dissolution dominated the neutralization process. An analysis of performance data for 30 VFWs found that a few achieved removal rates ≥40 g m−2 day−1 (Rose and Dietz 2002), but later evaluation indicated that 35 g m−2 day−1 is a more accurate performance standard (Rose 2004a, 2006). Fifteen VFWs in WV decreased acidity at rates ranging from 2 to 800 g m−2 day−1, with an average of 87 g m−2 day−1 (Skousen and Ziemkiewicz 2005). In addition to their use as a stand-alone treatment, VFWs can be coupled with other treatment systems to manage unique AMD situations. Water with high metal loads can be passed through multiple VFWs in series, separated by sedimentation basins for metal floc removal. Since DO concentrations are often a design limitation for other AMD passive treatment systems, a VFW can be used as pre-treatment to reduce the DO, for instance, before the water is introduced into an ALD. An important modification to the original VFW design is the addition of 10–25 % by volume of fine limestone particles into the organic substrate. With this modification, VFWs are capable of treating water with high Fe and Al concentrations. For example, installation of such a substrate at a Pennsylvania mine site caused water pH to increase from 2.8 to 7.4, and reduced both Fe and Al concentrations from >36 to <1 mg L−1 (Hedin et al. 2010, 2013). Effluents were net alkaline (pH > 7.4) for 6 years. In 2010, the PA DEP sampled about 140 VFW systems. Of the sites built since 2004 using a sizing criterion of 35 g m−2 day−1, at least 60 % released net alkaline water (Rose 2013). Older sites, designed on retention time in the limestone, had a higher likelihood of releasing net acid effluent. Rose (2013) in his evaluation of 20 VFW systems selected from the PA DEP survey for poor performance found that >50 % did not treat the influent AMD to a net alkaline state, often due to faulty design or construction or to a lack of essential maintenance (Supplementary Table 1). Of those with correct designs, all removed ≥85 % of influent acidity. 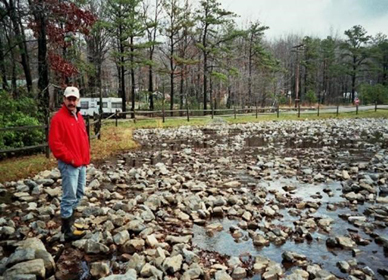 At several of these VFW treatment sites, the receiving stream has returned to fishable status, even if the treatment system did not remove all of the acidity. VFWs are an effective AMD treatment method when properly designed and constructed. But these systems require periodic maintenance (Hedin et al. 2013), such as occasional agitation of the organic substrate to dislodge accumulated metal flocs and flushing (Fig. 5). They accomplish acid removal consistent with design standards. Flushing systems have been devised that remove more of the metal floc so that less accumulates. VFWs also need to be inspected and cleaned out when efficiency declines due to compost degradation and metal floc accumulation. Like AnWs, the substrates will need to be removed when the metal flocs build up or as the substrate becomes unreactive. Extensive data on hundreds of VFWs and other passive systems in Pennsylvania are available in the website http://www.datashed.org. Mn is thermodynamically insoluble at circumneutral pH, but the abiotic rate of Mn removal in natural environments is extremely slow. However, the formation of these compounds is facilitated and catalyzed in nature by common microorganisms (Brock et al. 1994; Ghiorse 1984; Ghiorse and Ehrlich 1992; Robbins et al. 1999; Tebo et al. 2005). The bacteria are aerobic heterotrophs that use dissolved oxygen (DO) to oxidize organic matter as a source of energy. Formation of Mn precipitates by these bacteria on rock surfaces in stream channels and riverbeds has been observed at many locations (Emerson et al. 1982; Gregory and Staley 1982; Lewis 1976; Marshall 1979; Mustoe 1979; Wilson 1980). From such experience, it has been observed that Mn can be easily removed passively in mine water with a near-neutral pH by simply providing an appropriate surface area for the Mn-oxidizing bacteria to populate down-gradient of the constructed wetland. The precipitation of additional Mn is then accelerated by the presence of these precipitates; the precipitation reaction is autocatalytic (Davies and Morgan 1989; Rose et al. 2003a, b; Tebo et al. 2005). To create the right environment for Mn removal to occur, the key requirements are to: provide an abundant amount of rock surface area as a growth substrate for the bacteria; ensure that the water contains abundant amounts of DO; if necessary, add sufficient amounts of alkalinity to increase the pH of the mine water to at least circumneutral levels; and, to the extent practicable, avoid the potential impacts of large storm water flow events on the retention time and stability of the channel. This approach has been successfully used at many mine sites as a polishing step following conventional passive mine water treatment (e.g. Rose et al. 2003a, b; Sikora et al. 1996; Watzlaf et al. 2004). It is increasingly common to see limestone-filled channels constructed downstream of mine water passive treatment systems that have removed virtually all of the dissolved Fe. Strictly speaking, any rock surface will do, but using limestone keeps the pH high enough to allow reasonably fast Mn removal. Normally, the major obstacle to successful Mn removal using this mechanism is dissolved ferrous Fe because the Mn precipitate adsorbs the ferrous Fe, which chemically reduces the Mn, rendering it soluble and leaving oxidized Fe behind. Means and Rose (2005) and Rose et al. (2003a, b) studied a number of limestone beds designed for Mn removal. Based on these empirical observations at multiple sites and a range of conditions, Mn removal rates typically range from 2 to 10 m−2 day−1 (Rose et al. 2003a, b). The rates are most likely linked to the extent of bacterial activity, as well as factors such as water depth, DO concentrations, Mn concentrations, and pH. However, given the relatively low cost of adding additional limestone, it is generally best to make the limestone-filled channels as large as practical. Essentially all of the Fe and Al must be removed by pre-treatment to avoid clogging and the pH must be >6 before Mn is removed; Mn removal proceeds much better at a pH ≥ 7. These MRBs superficially resemble OLCs and LLBs, but the mechanisms and requirements are different. OLCs are generally installed where there is a relatively high slope so that Fe precipitates can be scoured from the limestone. Mn removal will occur in OLCs if all of the dissolved Fe is removed, but it is rare that dissolved Fe concentrations get sufficiently low. Also, scouring of precipitated Mn is discouraged since the precipitated Mn catalyzes additional Mn removal. Likewise, Mn removal will also occur in LLBs if all of the dissolved Fe is removed, but LLBs are typically at least a meter deep; observations indicate that Mn precipitation is more rapid near the water surface, probably because of DO depletion with depth. Therefore, MRBs are typically shallow channels filled with fist-sized limestone rock. Because good air–water contact is required, the rocks should normally project out of the water. An added advantage of MRBs is that Mn oxide minerals adsorb or incorporate substantial amounts of many trace metals. These interactions can decrease dissolved trace metal concentrations by orders of magnitude, even when only small amounts of Mn oxide is present (Jenne 1968; Tebo et al. 2004). Therefore, an MRB has been constructed at an old vanadium mine site where dissolved Zn and occasionally Ni exceeded permitted levels. The Fe concentrations there were naturally low and Mn, though typically present at concentrations over 10 mg/L, was not regulated because the natural background Mn concentrations in the area were high. Within a few months after construction, Mn oxidation and removal had been established and base flow trace metal concentrations were no longer in exceedance. Mn and trace metal removal there continues to improve. The most common problem experienced with all limestone-lined channels is that the limestone bed can become plugged over time with silt, leaves, algae, organic matter, or other material (Rose et al. 2003a, b). Thus, monitoring and some occasional light long-term maintenance (e.g. occasional raking of the channel to remove debris) may prove to be necessary. Bioreactors, which are sometimes called sulfate-reducing bioreactors (SRB), are similar to VFWs except that organic matter is the main reactant, commonly with limestone completely mixed with the organic matter (Gusek 2004). Microbial sulfate reduction is the primary form of treatment (Neculita et al. 2007). These systems are capable of handling very acidic and metal-rich water, including mine drainage with transition and other metals. However, flow rates through these systems are slow, so they are most applicable to small flows or to relatively large systems; sometimes, multiple units are operated in parallel. 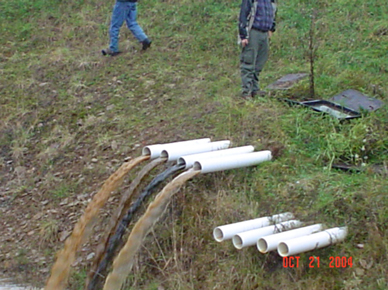 Most bioreactors are used to treat metal mine drainage (e.g. Rutkowski et al. 2013), but a few have been constructed to treat acidic coal mine effluent, typically to remove selenium (Sandy and DiSante 2010). 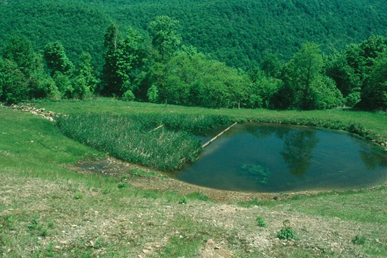 Other examples of bioreactors treating AMD from coal-mined sites include the Jennings site in PA, which plugged after 8 years but was restored by mixing and adding new reactants (Rose 2004a); the Fran site (Gusek and Schueck 2004); the Strattanville, PA, site where the system worked satisfactorily for 2 years but then failed in part because of lack of maintenance (Rose 2010); and the Reed site, which effectively treated a large flow for at least a year (Rose 2010). Experiments on the effectiveness of a wide variety of organic materials are summarized in Table 2 and discussed further below. Commonly, relatively fine limestone or other calcareous materials (mussel shells, calcareous wastes, etc.) are mixed with the organic matter to help maintain the pH in a better range for sulfate reducers and to help neutralize the acidity. Amounts of carbonate range from a few percent to several tens of percent by volume. Bioreactors are sometimes affected by bed compaction, which reduces permeability and promotes short circuiting. It is common to add strong particles such as gravel, coarse sand, walnut shells, and wood chips to minimize compaction and maintain permeability. Start-up of bioreactors can be slow, while the microbial system adapts to the AMD composition and substrate. At the start, the systems may be filled with fresh water mixed with small amounts of AMD to initiate sulfate and Fe reduction; the AMD is introduced at the design flow rate as the microbial system activates. The bioreactor may be inoculated with microbes from other functioning systems to accelerate effective treatment. To date, little attention seems to have been paid to initial establishment of specific microbial species, such as those that degrade the organic matter into compounds used by sulfate-reducers, although their importance is well recognized. A significant product of bioreactors is Fe sulfide, which removes both Fe and S from solution. FeS precipitates in the organic layer, but in some cases, the FeS is also present in the effluent and settling pond, possibly along with native S. If these are present, these products must be kept in an anoxic environment because their oxidation will generate acidity. Bioreactor performance can be distinctly seasonal, with slower remediation in winter. A few bioreactor systems rely on the addition of a small amount of organic supplement periodically to provide nutrients and carbon for the microorganisms (Buccambuso et al. 2007; Sobolewski 2010; Tsukamoto et al. 2004; Zamzow et al. 2006). The potential for VFWs to clog with Al and Fe hydroxides was recognized early (Kepler and McCleary 1997) and structures to allow precipitates to be flushed from the limestone layer and pipes were installed. The early structures were manually operated with an outlet valve placed below the water level of the pond (Supplementary Fig. 1). Results from this approach were mixed. Kepler and McCleary (2003) found that flushing improved VFW effectiveness and extended useful lifetime. Watzlaf et al. (2002) found that less than 5 % of the accumulated Al precipitate was removed during a flushing event. Designs that increase the depth of water over the organic layer to a meter or more would be expected to increase flushing effectiveness relative to shallow-water designs, but that expectation has not been tested experimentally. The decreasing effectiveness of flushed VFWs and Al accumulation on top of the limestone bed suggests that manual flushing is not a complete solution to rejuvenating VFWs when Al is present. Vinci and Schmidt (2001) proposed the use of automatic flushing siphons to increase flushing frequency from manual flushing, typically on a monthly schedule or to shorter intervals depending on flow rate. These siphons trigger when the pond fills to its pre-determined level. Flushing siphons have been successfully used at several sites. A more recent flushing technology is the Agri-Drain Smart Drainage system (Agri-Drain Corp., Adair, IA). This system is programed to open a valve at certain time intervals or water levels to flush accumulated floc. Solar panels provide power so flushing can be as frequent as several times a week. This technology has been used successfully at a number of sites (Wolfe et al. 2010). More elaborate underdrain systems have been designed to improve precipitate removal. Weaver et al. (2004) evaluated processes removing flocs during flushing, such as flow velocity, and provided design criteria for a double-layer-flushing underdrain system to provide maximum flow velocity. The upper layer of pipes is near the top of the limestone layer where Al hydroxides are presumed to accumulate. A pilot experiment using an automatic flushing siphon flushed about 80 % of the Al floc from a limestone bed, in contrast to the <5 % found for manual flushing at monthly intervals. Danehy et al. (2002) described systems with two layers of underdrain pipes in the limestone bed, divided into as many as eight subsystems capable of being flushed separately. This system has been used with improved results at several sites but is relatively expensive to construct. Since organic materials play such a crucial role in biological passive systems, a variety of organic materials have been evaluated (Place et al. 2006; Neculita et al. 2007; Rose 2010). Organic materials provide sorption sites for metals, and nutrients and attachment sites for microorganisms that perform essential functions, including DO consumption. A community of microorganisms is needed to degrade recalcitrant components and produce simpler organic compounds for use by the sulfate-reducing bacteria. A wide range of organic materials have been tested for effective sulfate reduction (Table 2). These materials can be classified as: (1) easily-available substances (soluble sugars, starch, amino acids, and proteins), (2) cellulose and hemicellulose, and (3) lignin (Gibert et al. 2004). The first group are consumed relatively easily and rapidly by sulfate-reducing bacteria and their associated microbes but are commonly depleted during the first months of AMD treatment (Place et al. 2006). Cellulose is degraded slowly to simpler organic compounds by fermenting bacteria and other cellulose degraders, and the cellulose-degradation rate likely determines sulfate reduction rates in most materials. Most lignins, however, are degraded slowly, if at all. Place et al. (2006) and Zagury et al. (2006) have determined the cellulose and lignin composition in a variety of organic materials. Some researchers have found that composted materials perform less well than “fresh” organic material (e.g. manure), but composted materials work well in most cases, are less odiferous, and release less nitrates downstream. A relatively recent innovation is the use of chitin-bearing crab shell waste as a component of the organic layer (Newcombe and Brennan 2010; Robinson-Lora and Brennan 2010). Crab shells consist of very thinly intermixed chitin, an easily biodegradable organic material, and CaCO3 accompanied by simpler organic compounds. The very fine intergrowth of these materials makes it very effective in promoting sulfate reduction and neutralization and adsorption of contaminants. The rate of acidity removal by chitin-based media was more than ten times greater than by limestone-amended compost (Robinson-Lora and Brennan 2010), but the material is relatively costly at present. ALDs are buried trenches or beds filled with limestone into which anoxic AMD is introduced (Fig. 6). Based on early practical work (Brodie et al. 1991; Nairn et al. 1991; Skousen 1991; Turner and McCoy 1990), Hedin et al. (1994) provided geochemical justification for the long-term performance of ALDs. For effective operation, ALDs must be sealed to minimize O2 entry and CO2 escape. AMD emanating from underground will generally have low DO concentrations (<1 mg L−1) and elevated CO2 partial pressures (pCO2) values (>10−1 atm). On contact with acid water under low DO and high pCO2 conditions, limestone dissolves, raising pH and adding bicarbonate alkalinity. Under these conditions, limestone dissolution is controlled by the saturation index of calcite. Limestone does not coat or armor if Fe is present in the ferrous (Fe2+) state, as ferrous hydroxide (Fe(OH)2) does not form until pH > 8.0, which is higher than what is achieved in properly functioning ALDs. Appreciable concentrations of dissolved Fe3+ or Al will result in precipitation and coating of limestone surfaces (Watzlaf et al. 1992; Ziemkiewicz et al. 1997) or in clogging of the interstitial spaces (Faulkner and Skousen 1994; Watzlaf et al. 1994), which degrades system performance and shortens the effective lifespan (Nairn et al. 1992; Watzlaf 2000a). To minimize the risk of failure, influent AMD should contain less than 1 mg L−1 dissolved Fe+3, Al, and O2 (Hedin et al. 1994). Since AMD often contains elevated concentrations of dissolved Fe3+, Al, and O2, other passive treatment technologies to strip O2, convert Fe3+ to Fe2+, and precipitate Al3+ in a submerged organic substrate have been studied (Kepler and McCleary 1994; Skousen 1995). ALDs were first described by Turner and McCoy (1990) in Tennessee. Brodie (1993) reported that ALDs improved the capability of wetlands to meet effluent limitations without chemical treatment. Treatment of AMD with low DO, Al, and Fe3+ using ALDs has been found to be successful if the systems are designed, constructed, and operated correctly. Based on experiments in cubitainers and full-scale limestone drains, Cravotta and Watzlaf (2002) and Cravotta (2003) derived rates of acid neutralization for ALDs and recommended a sizing method. Mukhopadhyay et al. (2007) extended this work. Models for calcite dissolution and gypsum precipitation in ALDs have been described (Huminicki and Rimstidt 2007), including waters with SO4 2− concentrations above 1500 mg L−1. Hedin et al. (2010, 2013) described an ALD that has treated influent mine drainage of pH 6, 36 to 58 mg L−1 of acidity, 42 mg L−1 of Fe, and <1 mg L−1 of Al at a flow of 430 L min−1 without maintenance for 18 years. The water produced was net alkaline after Fe precipitation in settling ponds. Skousen and Ziemkiewicz (2005) evaluated 36 ALDs and observed a wide range of acid load treatment (0–130 t year−1) but found no apparent relationships between ALD effectiveness and the pH of influent water or residence time. The average acidity removal rate was 86 g t−1 day−1 of limestone. Zipper and Skousen (2010) demonstrated that these systems’ alkalinity-generating performance increased in response to increasing influent acidity and residence times. However, Hedin et al. (1994) found that treatment effectiveness decreased as calcite saturation was approached. When properly designed, ALDs perform well over the expected lifetimes and are the most consistently efficient and cost-effective passive treatment systems in terms of the cost per metric ton of acid removed (PA BAMR 2009; Ziemkiewicz et al. 2003). OLCs are constructed with large dimension limestone in areas with steep slopes into which AMD flows (Ziemkiewicz et al. 1994). The AMD is neutralized and oxidized by the OLC (Fig. 7), which causes precipitation of metal hydroxides. The metal hydroxides coat the limestone surfaces or plug the limestone channel, thereby retarding neutralization. Research has shown that coated (armored) limestone continues to dissolve but at a much slower rate (20 % reaction rate) than unarmored limestone (Pearson and McDonnell 1975). Ziemkiewicz et al. (1997) confirmed the slower reaction rate and found armored limestone to be 10–50 % as reactive as unarmored limestone. Santomartino and Webb (2007) found limestone armoring to be comprised of Fe-bearing minerals including goethite and lepidocrocite, but that the limestone continued to react despite this armoring, and that armoring can be removed by agitation. Therefore, OLCs are most effective in treating AMD on steep slopes that receive periodic scouring from storm flows. Field studies have found OLCs to be functional at many sites, and they are extremely inexpensive to construct and maintain. Seven OLCs reduced AMD acidity by 4–205 mg L−1, at removal rates of 0.03–19 mg L−1 per meter of channel length (Ziemkiewicz et al. 1997). The highest removal rates were for channels on relatively steep slopes (45–60 % slope) and highly acidic waters (500–2600 mg L−1). In another study, three OLCs were found to neutralize 30–60 % of the incoming AMD acidity (Ziemkiewicz and Brant 1997). Cravotta and co-workers have experimented with OLCs for several large AMD flows with relatively low Fe (<10 mg L−1) and Al concentrations (Cravotta 2007, 2008a, b; Cravotta and Trahan 1999; Cravotta and Ward 2008; Cravotta et al. 2004, 2008). In these systems, aerated AMD with low acidity passed through a bed of relatively coarse limestone, where Fe and Al precipitated as loose flocs and coatings. They found that much of the Fe and Al floc either washed out of the drains during storm events or had limited effect on inhibiting limestone dissolution, so effective neutralization and metal removal continued for many years. However, if the flow channelized or the water had higher Fe levels, the limestone became coated and pore spaces in the limestone channel became clogged. OLCs are effective for a wide range of acidities and metal loadings, and they work best on slopes > 20 %. In practice, the slow reaction rate for armored limestone can be compensated for by extending the channel length/residence time (Ziemkiewicz et al. 1997). Flushing of coated limestone with sediment-laden water during high rainfall events and physical agitation with heavy equipment will rejuvenate limestone treatment effectiveness by exposing fresh surfaces. In appropriate situations, OLCs are being implemented for long-term treatment. OLCs are most effective at the upstream side of a passive treatment sequence where the AMD is most acidic. OLC efficiency decreases as pH increases above 3.0. LLBs are small basins filled with coarse (2–10 cm diameter) limestone scaled to provide at least 30 min of residence time (Fig. 8). They can be constructed at the upwelling of an AMD seep or in an underground mine discharge. They can be also used to pre-treat AMD with low pH (<3.0) and DO (<1 mg L−1) in either an upward or downward flow strategy. The latter, however, are more prone to clogging. Black et al. (1999) reported that a 30 min residence time in LLBs was sufficient to remove about 50 % of the acid load from slightly acidic water (pH 6.0, ≈20 mg L−1 of influent acidity). They also found that 30 min of contact with limestone removed much of the proton acidity in pH 3.0, metal-free water. Ziemkiewicz et al. (2002) reported that LLBs were useful at the upstream end of OLCs since they shortened their required length, improved their service life, and were easily serviced. LLBs can also be used as stand-alone systems. Self-flushing systems can be incorporated into LLBs to better control residence time while providing more effective floc removal. An up-flow, manually-flushed LLB was constructed at Strattanville, PA, in 2004 to treat water with 400–650 mg L−1 acidity and pH 4.5 at a flow rate of 380–570 L min−1 (Schueck et al. 2004). The pond had an area of 61 × 14 m and contained 1.3 m of limestone aggregate (2.5 cm maximum dimension). The water entered through perforated pipes in the bottom of the limestone layer and flowed upward to the surface. The pond was flushed downward periodically. It generated 175–250 mg L−1 alkalinity in the first year, but was only flushed twice during the succeeding 2 years and subsequently clogged. In 2007, the pond was expanded to about 140 × 18 m area, 1.3 m of new limestone aggregate was placed, and a daily timed-flushing system was installed. The effluent now averages pH 5.9 and 260 mg L−1 acidity. The effluent flows to a settling pond and then to a large SRB for further treatment. LLBs have also been used to raise the alkalinity in metal-free water, which can then be mixed with AMD. Thorne and Pitzer (2003) describe two sites where LLBs were successfully used to treat acidic water containing low concentrations of dissolved metals, which then flowed to a lake resulting in restored fish populations in the lake as well as its receiving stream. Others have used LLBs to renovate outflows from other passive systems containing low concentrations of remnant undesirable levels of Fe, Al, and Mn (Hilton et al. 2003). A recent development has been the use of flushed LLBs to treat high-Al discharges (Hedin et al. 2013; Wolfe et al. 2010). In these systems, a bed of limestone gravel a meter or more thick is filled with AMD and then periodically flushed by opening a valve to allow rapid flow of the treated AMD out of the LLB and into a settling pond. The rapid flow flushes much of the Al and Fe hydroxide flocs from the LLB. The flushing can be performed manually or with an automated device. Experiments by Wolfe et al. 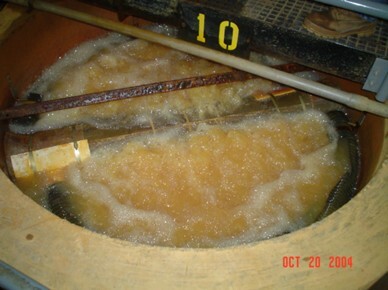 (2010) show that about 50 % of the floc is flushed if the LLB is drained weekly. In one experiment, a LLB received AMD with pH 3, 10 mg L−1 of Fe, 15 mg L−1 of Mn, and 27 mg L−1 of Al for 2 years with weekly flushing. A net-alkaline effluent was maintained during this period. After about 2 years, the limestone was cleaned by agitating it with an excavator and removing the dislodged precipitates by flushing, after which the system regained its original neutralization capability. Like OLCs, these systems require periodic maintenance to remove accumulated solids. Steel slag is a byproduct of steel production and is often available from metal recovery operations that mine old slag piles and grind the slag into sand to fine gravel sizes. The residual material is thus uniformly sized for use in AMD treatment. SLBs, first described by Ziemkiewicz (1998) and Ziemkiewicz and Skousen (1998), use steel slag as a cost-effective means of generating alkalinity for introduction into AMD sources. The alkalinity content (or liming potential) of steel slags ranges from 45 to 78 % CaCO3 equivalent. Ziemkiewicz and Skousen (1998) recommend the use of basic steel slags, which are distinguished from specialty (stainless) steel slags that contain higher concentrations of toxic metals such as nickel, chromium, and lead. These specialty slags should be avoided unless thoroughly characterized. Many AMD-impaired watersheds have some uncontaminated water upstream of the AMD sources. Often this uncontaminated water is slightly acidic with little or no alkalinity, so it has little buffering effect on downstream AMD. Steel slag is used to enhance the alkalinity of these uncontaminated water sources. The slag’s capacity to generate alkalinity can be estimated by jar tests since the rate of alkalinity generation when placed in water is generally very fast. With the alkalinity concentration known, the flow rate of water can be regulated to achieve a specific load of alkalinity that can be targeted to neutralize the AMD load (Ziemkiewicz 1998). Steel slag leached with distilled water can produce an initial alkalinity of over 2000 mg L−1. Leachate pH from slag can be >11; the alkalinity comes from CaO and tri-calcium silicate minerals. The former is highly soluble and is quickly released, while the latter provides long-term, but much less-concentrated alkalinity. Ultimately, the amount of alkalinity generated depends on particle size and contact time. SLBs should be charged with metal-free water because exposure to AMD results in rapid clogging with Fe and Al hydroxides (Ziemkiewicz 1998). Even with metal-free water, the high pH of these beds will result in carbonization and calcite formation which will cause clogging over time; this can be minimized by maintaining a water cap over the slag. Simmons et al. (2002a, b) used check dams made of fine steel slag and limestone, in combination with an OLC, to treat several small flows of water with acidities of 12–30 mg L−1, and a pH of 4.1–5.0. The LLB-SLB system generated effluents with an alkalinity of 170–225 mg L−1 and a pH of 8–9.5 for over a year. In Ohio, extensive reclamation efforts at the Broken Aro Mine have used SLBs receiving both AMD and metal-free water (Laverty et al. 2007). The SLBs have been used in combination with surface water diversion, VFWs, settling ponds, and other technologies to remediate this highly polluted area. The SLBs, which contained about 10,000 t of steel slag, contributed large amounts of alkalinity, causing the acid load from the area to decrease by 700 kg day−1. Successful water treatment was similarly attained using SLBs and other techniques at the Huff Run watershed in Ohio (Hamilton et al. 2007). A diversion well is a simple device, initially developed for treatment of rainfall-induced stream acidity in Norway and Sweden (Arnold 1991), and has been adopted for AMD treatment in the eastern USA. A typical diversion well consists of a cylinder or vertical tank of metal or concrete, 1.5–1.8 m in diameter and 2–2.5 m in depth, and filled with sand-sized limestone erected in or beside a stream or sunk into the ground beside a stream (Fig. 9). A large pipe, 20–30 cm in diameter, enters vertically down the center of the well and ends shortly above the bottom. Acidic water is fed to the pipe from an upstream dam or deep mine portal with a hydraulic head of at least 2.5 m (above the well height). The incoming water exits the pipe near the bottom of the diversion well under pressure and then flows back up through the limestone in the well, thereby fluidizing the bed of limestone in the well. The flow rate and water energy must be large enough to agitate and fluidize the bed of limestone particles. The acidic water dissolves the limestone, generating alkalinity; metal flocs produced by hydrolysis and neutralization reactions are kept suspended and are flushed through the system by the water current out through the top of the well. The churning action of the fluidized limestone also aids limestone dissolution and helps remove Fe hydroxide coatings so that fresh limestone surfaces are continually exposed. Metal flocs suspended in the water can be settled in a downstream settling pond. The limestone in the well must be replenished frequently, commonly weekly to monthly, depending on water flow and acidity concentrations. Arnold (1991) used diversion wells for AMD treatment in PA and reported that three wells increased pH in the stream from 4.5 to 6.5, with corresponding decreases in acidity. Diversion wells reduced water acidity by 60 % at the Casselman River (Ziemkiewicz and Brant 1997). At the Galt site in WV, a diversion well increased pH from 3.1 to 5.5 and reduced acidity from 278 to 86 mg L−1, a 70 % reduction (Faulkner and Skousen 1995). Pulsing systems have also been devised to increase the alkalinity from diversion wells (Sibrell et al. 2005, 2013). LS sand treatment is the addition of sand-sized limestone to streams in a watershed (Zurbuch 1996). The sand is suspended by the streamflow and redistributed downstream, neutralizing acid as the energy of the stream transports the limestone (Fig. 10). Coating of limestone particles with Fe hydroxides can occur, but the energy of the water in the stream causes agitation and scouring of limestone to keep fresh limestone surfaces available for reaction. This technology can be more cost effective on a watershed scale than more conventional passive treatment of AMD discharges if resources for continued additions of limestone sand are available. 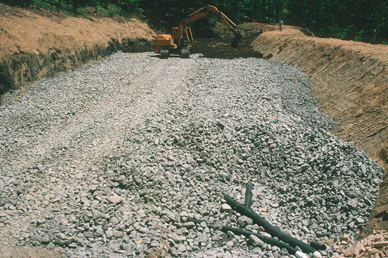 The State of West Virginia used limestone sand additions to restore several river systems. About 450 km of streams affected by acid deposition and AMD were treated. For example, in the Middle Fork River, 41 sites in tributary headwaters were loaded with limestone sand (Zurbuch 1996). Based on the annual acid load of the river (2000 t year−1), 500 t of limestone sand were added at 3 month intervals (quarterly). The pH has been maintained above 6.0 for several km downstream of the treatment sites and the anticipated coating on the limestone sand was not observed. Quarterly additions of limestone sand will be required to maintain water quality for fish populations over an extended period. A follow-up study (Brown 2005) reported continued success of the West Virginia limestone sand treatment project. River pH of the Middle Fork increased from 4.9 to 6.8, with conversion from net-acidic to net-alkaline water. A section of 200 km was restored to a trout fishery by this method. McClurg et al. (2007) studied the effects of limestone sand immediately downstream of application points. Small increases in Fe and Ca were observed in sediments within 100 m of the treatment site. 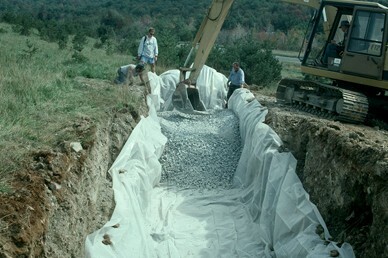 Constant addition of limestone sand or hydrated lime from a silo through an automatic feeder (doser) has shown good results in Maryland (Mills J., Personal communications on stream dosing and slag beds, MD Bureau of Mines, 2009). Dosers on severely contaminated streams have led to fish recovery in the Potomac River and several tributaries. The stream immediately below the limestone sand doser is impacted by Fe and Ca flocs, but most of the stream is greatly improved. 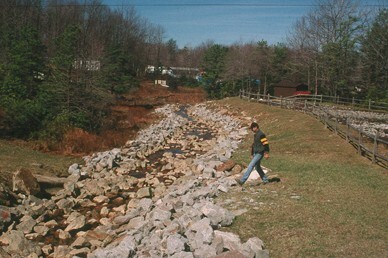 Dosers have been installed on several streams and discharges in Pennsylvania. 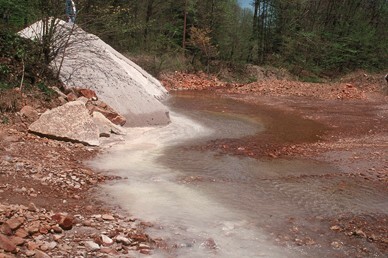 Thus, limestone sand application has been demonstrated to be an effective technique to restore fisheries in large watersheds. Low-pH Fe oxidation channels are a relatively recent innovation that can be used to partially treat high Fe discharges (Burgos et al. 2008; Hilton 2005). A shallow channel is constructed and lined with limestone or sandstone aggregate to enhance Fe oxidation and to promote adsorption and co-precipitation on rocks in conjunction with Fe-oxidizing bacteria. At a pH above 4.5, the rate of Fe2+ oxidation increases markedly by combinations of abiotic and biotic catalysis, but at a pH below about 3.5, the process can be catalyzed by specialized bacteria. A number of sites where this occurs naturally have been identified (Hilton 2005). At these sites, channel slopes and wide flow paths enable adequate air contact (Fig. 11). Fe2+ is oxidized to Fe3+, some of which precipitates, thereby decreasing dissolved metal concentrations. In the absence of limestone, the pH decreases from the released H+ and the acidity remains very low, but subsequent treatment of the acid is easier. At some sites, nearly all of the dissolved Fe was removed (Hilton 2005). The low-pH oxidation channels removed some Fe, but removal efficiencies have not yet been determined. The eastern USA has a long history of dealing with AMD from mining operations. Over the past several decades, a number of researchers and reclamation practitioners have contributed to the development of AMD passive treatment designs and science. With careful design and construction, systems can be effective over a wide range of metal and acidity concentrations. Relative to chemical treatment, passive systems require longer retention times and larger land areas. They are subject to failure if poorly designed and constructed, particularly if not correctly scaled to the target discharge flow and acid and specific metal concentrations. At their present stage of development, passive systems work well on low volume AMD discharges (<400 L min−1) containing moderate to high acidity and metals. Passive systems have been shown to effectively treat larger flows (up to 10,000 L min−1) for net alkaline water containing Fe. A critical activity in passive treatment is the selection of the proper system type for a given situation. Factors to be considered in selection include the quality and quantity of waters to be treated, water treatment goals, access, and the land resources available for use in system construction (Fig. 1). Generally, larger land areas (relative to anticipated acid loads) enable more effective treatment, and essential design features for all systems include surface area and/or volume (Table 1). However, specialized systems that require significant initial cost and regular maintenance (e.g. VFWs, bioreactors) are available for use where land areas are insufficient for traditional passive systems such as AnWs. Design factors, including those that are unique to certain system types, are described above. Passive systems have substantially reduced water treatment costs at many mine sites (Skousen and Ziemkiewicz 2005). Capital, maintenance, and operating costs are generally much lower than for active systems. Passive systems can reliably produce high quality discharges if properly designed, constructed, and maintained (Hedin et al. 2013). However, active treatment is often favored in settings where discharge quality is a regulatory requirement. Passive treatment is more suited for watershed-based AMD control schemes where high standards or specific effluent limits are not required at each discharge. In some cases, passive treatment is appropriate for regulated discharges at unstaffed and remote locations, where active-treatment operating risks and costs are especially high and where location characteristics allow for passive-system overdesign. Essentially all passive treatment systems require some degree of maintenance. The precipitates formed in passive systems are denser than those generated in active systems, so sludge handling is generally easier and less frequent. If settling ponds are adequately sized, cleanout may not be needed. Although periodic monitoring and maintenance is essential, the need is much less than in active systems. At a minimum, the systems should be inspected every few months for impediments to flow, leakage, and inadequate treatment. In addition, more extensive maintenance, such as replenishment of the alkaline reagent or organic matter substrate, and removal of accumulated metal precipitates, is occasionally required. Experience suggests that rehabilitation is typically required every 5–10 years, though that time will be influenced by system size and design. The science and practice of passive treatment for AMD have progressed over several decades. Numerous options are available to water managers who wish to use passive treatment to mitigate AMD discharges, but knowledge of site characteristics remains essential to successful passive system selection and design. Continued evaluation of passive system performance is needed across a variety of system types and across a wide range of water flows and chemistries, as such information will improve our understanding of how system design can enhance water treatment effectiveness. Improved strategies for maintaining these systems’ acid-removal efficiencies over longer terms are needed, as are design features that can ease essential maintenance tasks and increase functional lifetimes. AMD remains a problem in mining districts throughout the world, so the passive treatment technologies described in this paper have the potential for broad application. Continued development of new technologies and improvement of known systems through observation and research will undoubtedly further increase efficiencies and extend effectiveness for a broader range of water types and flows and different climatic environments.